Oscar Orellana has a story to tell. He is a 12th grader at UCLA Community School, located in the Koreatown section of Los Angeles, and he dreams of making a movie. “I want to make a video about my life, like who I am,” Oscar said, his eyes lighting up. But the odds are stacked against kids like him. In the 2016–2017 school year, 87.8 percent of students at his school were considered socioeconomically disadvantaged, and a 2015 study by the Los Angeles Times found that out of more than 700 public schools in Los Angeles, only 35 received an A grade. UCLA Community School got a C. On top of that, arts programs are underfunded, leaving aspiring creatives like Oscar with few resources for learning. But last fall, Oscar found a place to learn. Every Saturday morning he rode a bus 20 minutes to attend the videography program at RenewLA—a nonprofit that provides low-income youth with opportunities to explore future careers and learn valuable creative skills from professionals. RenewLA isn’t just another nonprofit. It was founded by Sovereign Grace L.A., a predominantly second-generation Korean-American church in downtown Los Angeles. Through RenewLA, the members of the church are building bridges with people in their city who they might not normally come across—people like Oscar. Many churches have outreach ministries that serve their communities. But RenewLA is a bit different, since it exists as a separate entity—though supported and largely staffed by church members. RenewLA was founded a decade ago as a nonprofit organization distinct from Sovereign Grace L.A., with hopes that churchgoers who joined the nonprofit could tackle social issues in Los Angeles, and partner with others in the city, without being restricted by the “Christian organization” label. It worked. 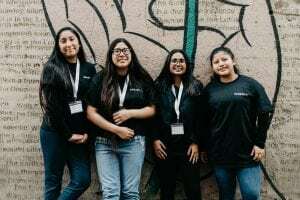 As a standalone nonprofit, RenewLA made connections with youth in and around downtown Los Angeles who might have been hesitant to join an explicitly Christian program. Each semester, RenewLA offers cohorts for different arts-oriented career tracks taught by professionals. Last fall, students chose between learning how to brew coffee, screen-print T-shirts, and perform in front of an audience. This spring, the three cohorts were coding, photography, and videography, with 10 students in each group, working all semester toward a culminating project. RenewLA strives to fulfill two purposes. The first is to help students learn creative skills and find new passions. The other is to create relational bridges, connecting Christian volunteers to underserved kids like Oscar and his friends. Hannah Cynn, coordinator for RenewLA’s videography cohort, struggled with the divide between the local community and her church circles. As a teacher, she knew the difficulties many of her students faced—such as having both parents working full-time or a sibling in jail—but she felt like few in the church understood the gravity of the problem. But through RenewLA, members of Sovereign Grace L.A. and other local churches are beginning to see their congregations get involved, learning about the lives and challenges of young people in their city. “I just felt like this is really God providing the bridge, and now they see a piece of my heart and God’s heart,” Cynn said. Last fall, Oscar was part of the performing arts cohort. He performed a monologue retelling the hardships of his early childhood. Oscar soon found himself alone and bullied at his elementary school. He was so traumatized that he contemplated suicide, locking himself in the bathroom with a knife. Thankfully, his uncle found him. His family helped pull him through his depression, with his uncle mentoring him and helping him find a passion and new skills in fixing cars. Oscar wrote about this story as one of his first assignments in the performing arts cohort. One of the mentors pushed him to rewrite it and share it for his culminating project. He agreed, with some hesitation. After sharing his personal story, Oscar said he felt free. Because he was so affected by his experience in the performing arts cohort, Oscar decided to participate in RenewLA’s program again in the spring semester, this time learning about videography. Bryan Cullison was the videography teacher for the spring semester’s cohort and a staff member at the World Impact Teen Center, which hosts RenewLA’s activities. Cullison came to downtown Los Angeles in 1996 as a missionary to youth in the city. During the 10-week course, Cullison not only taught students like Oscar how to use a video camera—including technical aspects like aperture and shutter speed—but also how to tell stories, especially their own. One of RenewLA’s goals is to empower at-risk kids to feel confident in their new skills and to have something tangible to show at the end of the program. Another goal of the program is to create relationships that continue after the cohort ends. Oscar, for one, planned to stay connected to RenewLA after he graduated from high school. On June 2, the students of RenewLA held their culmination event, in which they showcased their new skills to family and friends. Each member of the coding cohort created a website, while the photography cohort hosted a gallery with curated pictures. The videography cohort made short films on a personal topic or an issue in their community. Oscar made a film about his passion for auto repair. He acted and directed a re-enactment of the first time he changed the oil of a car under the supervision of his uncle and grandfather. But Oscar learned more than videography skills. He also learned leadership skills. As a non-religious nonprofit, RenewLA cannot measure “success” the way other Christian ministries might, by counting baptisms or conversions. Director Hanah Kim says her team at RenewLA has learned to have a kingdom-minded perspective in their work by studying books like Tim Keller’s Generous Justice, which encourages Christians to seek justice because they have received generous grace from God. RenewLA is not charity work. This is kingdom work. Hannah Chao is a staff member at All Nations Community Church in Lake View Terrace, California. She’s also a writer and editor for The Sola Network. You can follow her on Twitter.